A broken garage door is more than just an inconvenience, it’s a safety and security issue that needs to be addressed right away. That’s why it’s important to know who to call in the Pittsford and Rochester, NY, area to make sure your car is safe and dry before inclement weather settles in. At Black Hawk Lock and Key Garage Door Replacement, we come to you with all the parts and tools needed to get the job done right the first time. 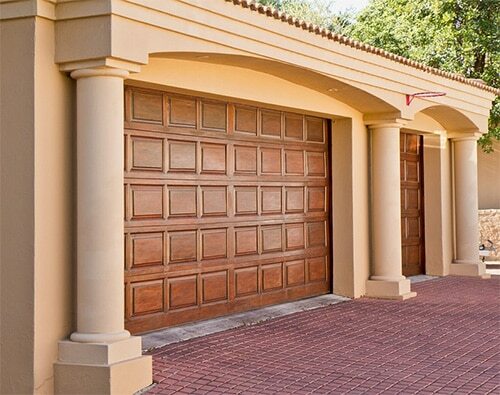 We can repair your existing garage door or replace it with vinyl, metal, or a high-end wood style. It costs up to $2,000 or more for door replacement cost at some companies. We do our best to keep your out-of-pocket expense to a minimum. One of the ways we do that is through our free in-home consultation and estimate – we want you to know what to expect as far as price and service go. A broken garage door results from years of wear and tear on the door mechanisms. It can also come from a malfunction of your door opener hardware. Black Hawk Lock and Key technicians diagnose the problem and provide you with solid guidance on the best way to remedy it, which doesn’t always mean replacing the entire door. What’s Involved in Garage Door Replacement? Your garage door is made up of springs, rollers, cables, hinges, and other parts. Sometimes, your issue can be fixed by adjusting the tracks and springs so that your door operates smoothly. Other times, the door must be replaced. Either way, you can count on a straight answer from our service staff. Our techs can handle most garage door styles, brands, and configurations. We arrive at your home and walk you through the options. If you want to move forward, we can arrange for a garage door replacement right away or at a time you choose. When you choose Black Hawk Lock and Key Garage Door Replacement, you get bonded, licensed and insured professionals determined not to let you down. We would love to hear from you regarding your questions and any feedback on our products or services. Let us know if you find what you’re looking for or need additional guidance. Best of all, we are available for free home consultations anytime. Black Hawk Lock and Key is the top provider of garage door replacement in Pittsford and Rochester, NY. Give us a chance to show you why our customers love us for residential and commercial lock and key services too.